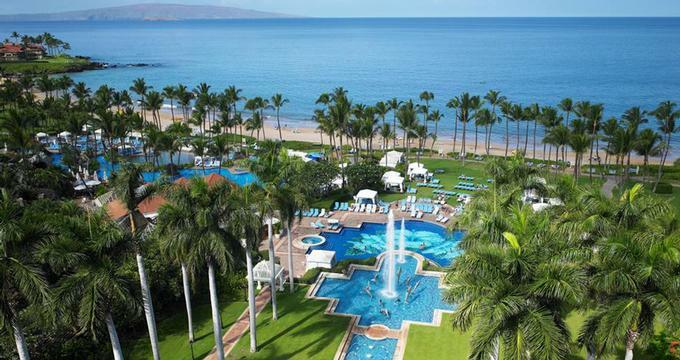 Grand Wailea Resort Hotel and Spa in Maui, Hawaii offers something for everyone. Set on 40 acres, it has one of the top beaches in the world, fabulous pools and a great golf course with spectacular views of the ocean and Mt. Haleakala. Spa Grande is a luxurious Hawaiian spa facility offering many soothing body treatments. < Grand Wailea Resort Hotel and Spa is destination for families. For kids ages 5 to 12, the resort provides Camp Grande, a 20,000 square foot area with a children's restaurant, craft room, theater, game room, computer room and outside play area. Children will love the nine pools with seven water slides and the world's first "water elevator." Kids can sign up for nature walks and workshops such as Lei Making or Ukulele lessons. Baby sitting services can also be arranged. The Wailea Tennis Club is an 11-court complex where guests can take tennis lessons or play a match. There is a PADI certified dive center which offers SCUBA certification classes. The resort has 780 spacious guest rooms, including 60 suites. All rooms have a private balcony, a sitting area and a marble bathroom with an oversized bathtub. The suites are lavishly decorated, some with a Jacuzzi tub. For added comfort, guests can stay in Napua Tower, a 100-room exclusive hotel within the resort. Guests have a choice of six restaurants and a selection of distinctive cuisines. Humuhumunukunukuapua'a is an exotic oceanside restaurant where you can eat great seafood and enjoy a spectacular sunset. Kincha is a traditional Japanese restaurant set in the midst of tranquil gardens, waterfalls and rock. Breakfast is served in the Grand Dining Room Maui with panoramic views of the ocean. At night, visit the nightclub or one of the six lounges. The resort features a $30 million art collection comprising of sculptures and paintings (Fernando Botero, Fernand Leger, Pablo Picasso, Andy Warhol) which demonstrates the care that went into the decorating. Nearby hotels include the Wailea Beach Villas and the Fairmont Kea Lani Maui. The concierge at the resort can arrange many activities, including deep sea fishing, helicopter tours, kayaking, volcano trips and whale watching. Also, be sure to visit Makena Beach, a secluded sandy beach which is a 10-minute drive from the hotel. Check the vacation packages offered by the resort and see if any include a rental car which will allow you to explore the hidden treasures of Maui. Also, take advantage of the services covered by the daily $12 (plus tax) resort service fee, including unlimited use of Spa Grande's Fitness Center, introductory scuba diving clinics and a landscape tour encompassing the resort's 40 acres of tropical gardens. To get around the resort, use the complimentary Wailea shuttle service. Maui is a year-round destination with its moderate tropical climate. The average annual temperature of around 75 degrees F (24 degrees C) fluctuates only a few degrees from summer to winter. To get to the resort, you can fly to the Kahului Airport, a 20-minute flight from Honolulu. The airport is 35 minuted by car from the resort. At the Kahului Airport you can rent a car to get around the island. Browse more active Maui vacation ideas, our tips for keeping your kids safe near water and more family getaway ideas for spring. Room rates from $369 per night. Check for Maui packages.